The Canellales are a small order of flowering trees and shrubs, most of which are found in the southern continents though some species reach as far north as Florida and Indonesia. 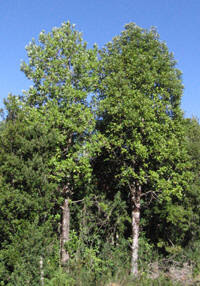 Two families are included in Canellales, the Canellaceae and Winteraceae. Canellaceae is found in the Ethiopian and Neotropical biozones, while Winteraceae is Australasian, Malesian and Neotropical (the image at left is of Drimys winteri [Winteraceae], and comes from Flora Chilena). Canellales are members of the "magnoliids" - the paraphyletic assemblage of basal flowering plants that aren't eudicotyledons, aren't monocotyledons, and are still proving difficult to place phylogenetically. 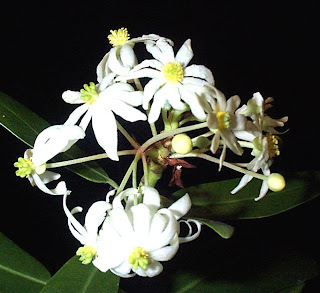 Recent analyses have all agreed that the so-called "ANITA grade" includes the basalmost flowering plants yet in existence (the name ANITA derives from the taxa included in this group: Amborella-Nymphaeales-Illiciaceae-Trimeniaceae-Austrobaileya). 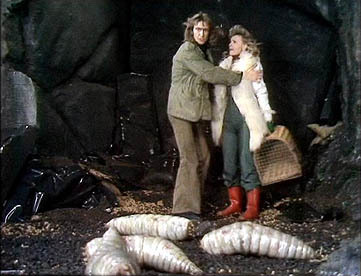 After that, it all goes a bit custard-shaped. As well as the well-established clades of eudicots and monocots, we have Chloranthaceae, Magnoliales, Laurales, Piperales, Aristolochiales, Canellales and Ceratophyllum (some authors, such as Thorne , have included some or all of these orders in an expanded Magnoliales), with almost every combination imaginable of these nine clades turning up somewhere. Nevertheless, there is a reasonable amount of molecular support for a true "magnoliid" clade including everything listed above from Magnoliales to Canellales, with Canellales probably sister to Piperales (including Aristolochiales - Zanis et al., 2002; Angiosperm Phylogeny Group, 2003). Though an association between Canellaceae and Winteraceae was first recognised on molecular grounds only, morphological characters have since been identified in support of the Canellales. Previously, Winteraceae had been regarded as very primitive flowering plants because of their lack of vessels, specialised xylem cells for the transport of water that are characteristic of flowering plants (xylem is the central part of the plant stem that transports most of the plants water through no-longer-living cells). In vessels, the axial ends of the deceased xylem cells has become perforated or open, so instead of separate cells the plant has continuous tubes allowing for much easier water transport. The only other angiosperms to lack vessels are Amborella (possibly the basalmost of all living flowering plants) and the small eudicot order Trochodendrales. However, the modern position for Winteraceae implies that its vessel-less condition is not primitive but derived from vesselled ancestors. What could have led the ancestors of the Winteraceae to abandon the seeming advantages of a vessel system? Field et al. (2002) compared the effectiveness of water transport in the vessel-less Winteraceae and the vessel-bearing Canellaceae. While Canellaceae had much more efficient water transport than Winteraceae, freezing and thawing had a much greater impact on water transport in Canellaceae than Winteraceae, leading Field et al. to suggest that the lack of vessels in Winteraceae might have been an adaptation to survive freezing cycles in temperate Gondwana. This seems to be the most likely explanation yet available, but as always with science, a whole host of other questions arise - if vessels are so problematic for cold-climate taxa, why have so few other angiosperms lost them? Field et al. do suggest that greater differences between vessels and standard xylem cells in more derived taxa may have put greater constraints on their loss, but I feel this is still very much an open question. One feature that Canellaceae and Winteraceae share in common is the notable production of aromatic oils by members of both families. Canella alba (shown here in an illustration from Wikipedia) was transported from South America to Europe as "white cinnamon", and its bark is used in much the same way as cinnamon. 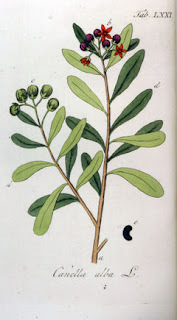 The leaves of horopito (Pseudowintera colorata), a small tree found in New Zealand, were used as a condiment, as are those of Tasmanian pepper (Tasmannia lanceolata). I can personally vouch for the edibility of horopito - it has a strong peppery taste, similar to nasturtium but far stronger. Angiosperm Phylogeny Group. 2003. An update of the Angiosperm Phylogeny Group classification for the orders and families of flowering plants: APG II. Botanical Journal of the Linnean Society 141: 399-436. Field, T. S., T. Brodribb & N. M. Holbrook. 2002. Hardly a relict: freezing and the evolution of vesselless wood in Winteraceae. Evolution 56 (3): 464-478. Thorne, R. F. 2000. The classification and geography of the flowering plants: Dicotyledons of the class Angiospermae (subclasses Magnoliidae, Ranunculidae, Caryophyllidae, Dilleniidae, Rosidae, Asteridae and Lamiidae). Botanical Review 66: 441-647. Zanis, M., D. E. Soltis, P. S. Soltis, S. Mathews & M. J. Donoghue. 2002. 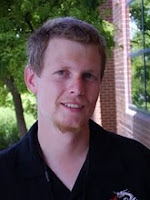 The root of the angiosperms revisited. Proceedings of the National Academy of Sciences of the USA 99: 6848-6853.